When you’re working on a deal, you generate lots of email correspondence. Updates, offers and negotiations are often handled electronically. You need a way to organize these deal-related emails, and ClientLook offers the perfect solution. Forget about all those folders or complicated tags you use in an attempt to organize emails. 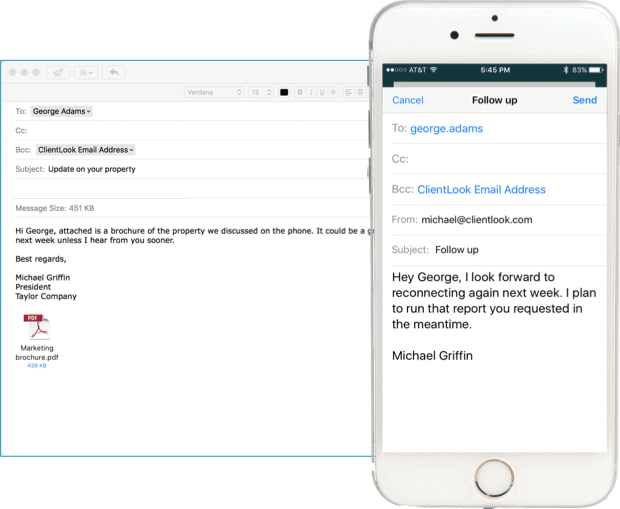 With ClientLook, just BCC the email address associated with your deal to effortlessly connect any message (and attachments) to that deal. It’s easy, and it works with any email software, computer and mobile device. Emails get connected to our deals as well as the recipients found in your account.